As summer starts to wind down you may be hearing the dreaded I'm bored, coming from your children. Here on The Avenue we are not immune to it either. TOF has given up naps and TC is still napping. I hate to plop TOF in front of the TV for that two hours but it's hard to keep him quiet while his brother sleeps and playing outside really isn't an option. It's been really hot here this summer and between heat and storms, we've spent a considerable amount of time indoors. Today I could see the sad look on TOF's face as I put TC down for his nap. We've already played every board game we have seventy eleven times and then Thomas came to our rescue! 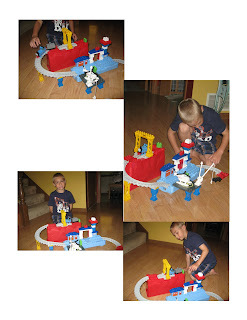 Enter the world of Thomas and Friends with this great buildable playset from Mega Bloks! When trouble happens on the Island of Sodor, The Sodor Search and Rescue team is called in to help. With the help of Thomas, Harold's watchful eye stretches from Vicarstown to Knapford and everywhere in between, keeping things safe on The Island of Sodor. Build the Sodor Search and Rescue playset in any way you wish, building to new heights and winding lows as buildable Thomas and Harold characters patrol the area. Use the hardworking crane to load and unload new cargo, land Harold on the Helipad to give him a break between patrols and turn trains on the track switcher to get them going towards new adventures! Build and rebuild Sodor Search and Rescue the way you see it! Literally take your builds and rebuilds high up into the Island of Sodor for a truly dynamic adventure! Includes different accessories like opening doors, track switcher and working crane - have a different Sodor Search and Rescue Adventure every time! Just like his uncles, TOF's loves to spend hours building with blocks and his frown turned upside down. 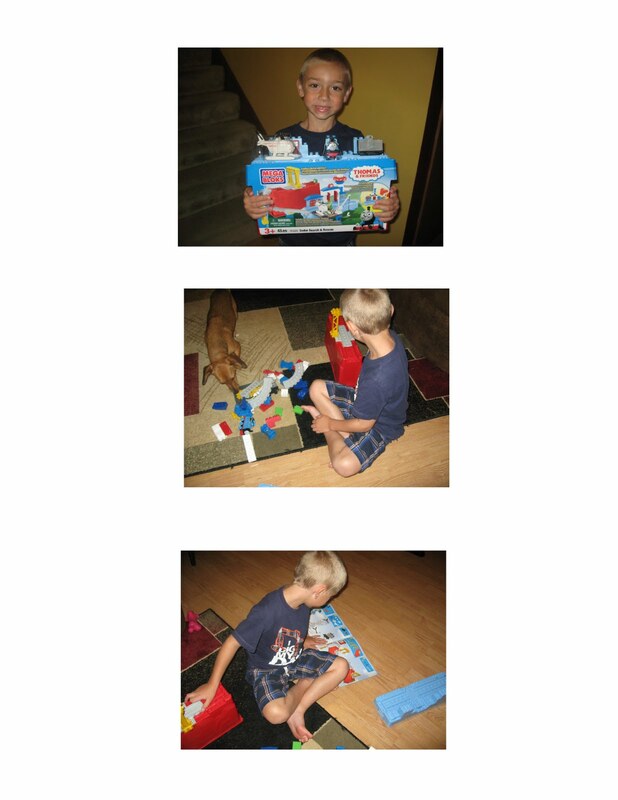 He quickly followed the directions and assembled the playset and characters. With a little help from me, he applied the stickers and the adventures began. There was an emergency on the Island of Sodor and Harold the helicopter had to help Thomas. There was a fire and Thomas couldn't get across the track. With help from the working crane, Harold airlifted Thomas over the fire and back to safety. The fire department was called to extinguish the fire and everyone cheered for Harold. TOF hardly even noticed the rain clouds rolling in again. Be sure to sign up for Mega Blocks Family Club to print a $5 coupon as well as other exclusive offers and promotions, and articles on the benefits of contruction toys. Disclaimer: We were sent the Mega Bloks toy for the purpose of review, all opinions are my own and no other compensation was received.